What You Should Know About Marco Rubio : It's All Politics The Florida senator got his start on the Bob Dole presidential campaign and was once Mormon. Here's what else you might not know. 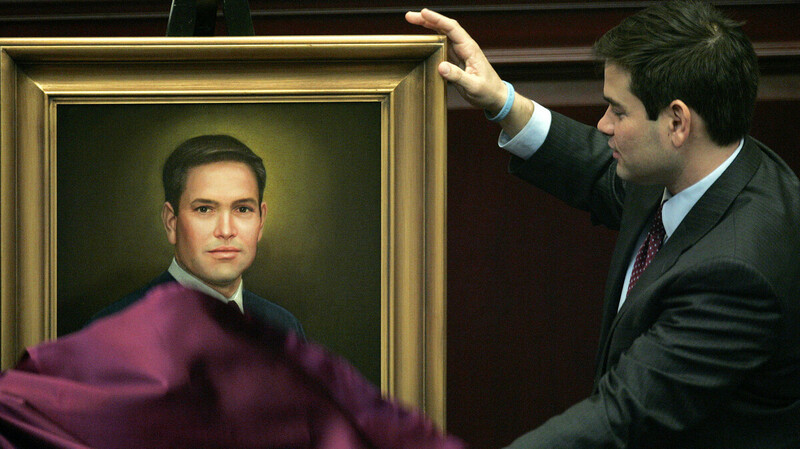 Rubio in 2008 as Florida House speaker, unveiling a portrait that would hang in the House chamber. Florida Republican Sen. Marco Rubio, who announced his bid for president Monday, was elected in 2010 as a Tea Party favorite. He's now trying to position himself as someone who represents a broad cross section of the Republican Party. At 43, he's one of the country's most high-profile Latino politicians and the GOP is counting on him to help win over voters in a demographic with which they've historically struggled. 1. He's the son of Cuban immigrants, but mixed up the date his father came to the U.S.
Rubio had a gripping narrative about his family leaving Cuba after the rise of Communist leader Fidel Castro in 1959, which struck a chord with many of his Florida constituents. But a 2011 review by the Washington Post found that his parents actually left Cuba for Miami in 1956 — not, as his bio once stated, "following Fidel Castro's takeover on the first day of 1959." 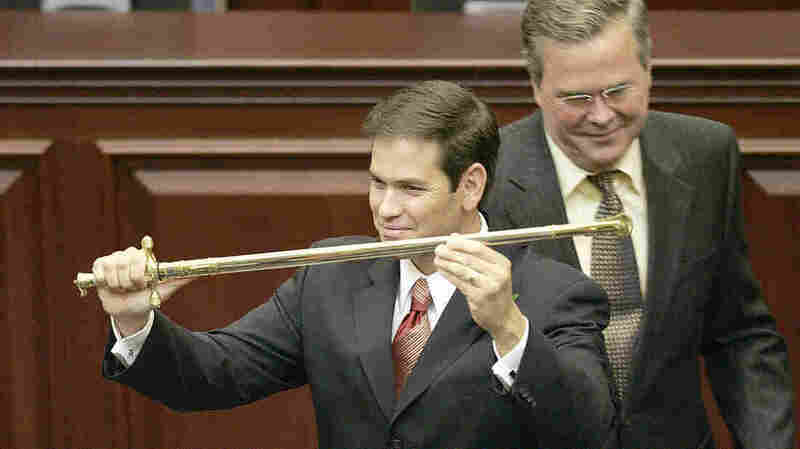 Rubio holds a sword presented to him by then Gov. Jeb Bush, during ceremonies in 2005 designating Rubio as Florida's next House speaker. He became the first Cuban-American to serve in that capacity. "If the Washington Post wants to criticize me for getting a few days wrong, I accept that," Rubio hit back in a Politico op-ed. "But to call into question the central and defining event of my parents' young lives — the fact that a brutal Communist dictator took control of their homeland and they were never able to return — it's something I will not tolerate." In 2006, Rubio became the first Cuban-American House speaker in Florida, and he tells his parents' story often as a point of pride. But that story has also created an issue that may get stirred up again during his campaign — his grandfather was once ordered deported from the U.S. but stayed anyway. 2. He was once (briefly) Mormon. The Rubio family, which was Catholic, moved from Florida to Nevada in the late 1970s and joined the Church of Jesus Christ of Latter-day Saints. According to Buzzfeed, the family was strongly influenced by first cousins living in the area who had converted to the faith a few years prior. The Florida senator was baptized into the Mormon faith when he was approximately 8 years old, and family members recalled that he was deeply invested in the religion having met with missionaries and attended LDS youth events. He even formed a singing group with his sister a la The Osmonds, who are among the most famous members of the Latter-day Saints. "He was totally into it," his cousin Michelle Denis told Buzzfeed. But once the Rubios left Nevada and returned to Miami, they rejoined the Catholic Church, apparently at the senator's urging. 3. He went to college on a football scholarship. Rubio, who went to college on a football scholarship, catches a pass from University of Florida quarterback Chris Leak during Leak's visit to Florida's House of Representatives in 2007. 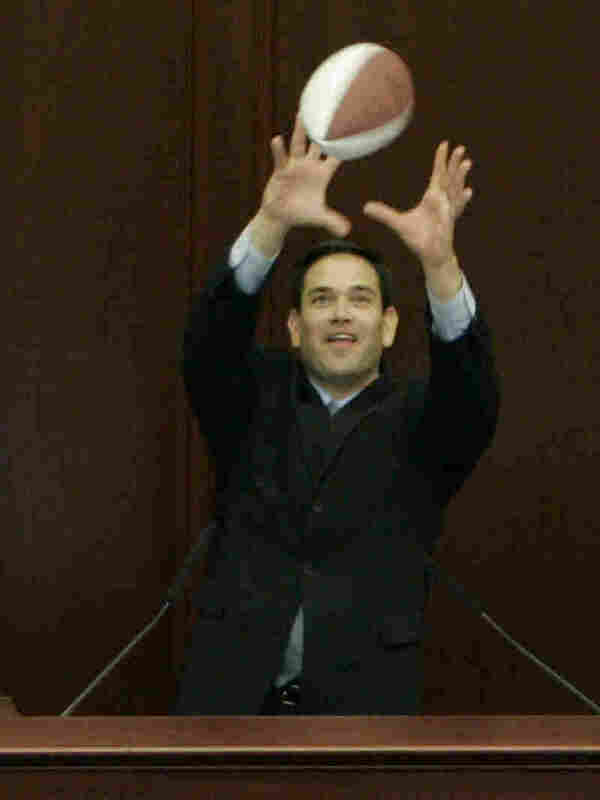 A star player at South Miami High School, Rubio went to Tarkio College in Missouri for one year on a football scholarship. He transferred to Florida's Santa Fe Community College, and then graduated from the University of Florida. He earned his law degree from the University of Miami. Rubio met his wife, Jeanette, who was once a cheerleader for the Miami Dolphins, at a neighborhood party after high school. She generally stays out of the spotlight these days, and is rarely seen on the campaign trail or making speeches. 4. He got his start in politics on Bob Dole's presidential campaign. Rubio got one of his first major roles in politics as 1996 Republican presidential contender Bob Dole's campaign chairman for Miami-Dade and Monroe counties in Florida. Manuel Roig-Franzia, in his biography The Rise of Marco Rubio, remarked that the senator, then 25, was already showing an aptitude for politics. "If this election was an audition for host of a talk show, Dole wouldn't stand a chance," Rubio told Maclean's magazine. "This is a campaign that will truly test whether we're a nation of substance or style." Dole ultimately lost the race to former President Bill Clinton, and also fared poorly in the two counties Rubio was tasked with overseeing. In 2014, Dole revealed skepticism in Rubio's ability to serve in the top role. "A number of the younger members, first-termers like Rand Paul, Rubio and that extreme-right-wing guy Ted Cruz — all running for president now. I don't think they've got enough experience yet," Dole told The Hill. In this frame grab from video, Florida Sen. Marco Rubio takes a sip of water during his Republican response to President Obama's 2013 State of the Union address. 5. His awkward sip of water went viral. What the Internet will remember most about Rubio's turn at the GOP rebuttal to Obama's State of the Union in 2013, was an uncomfortable pause in the middle of the speech as he took a swig from his water bottle. While speaking on foreign policy and the economy, the senator can be seen smacking his lips and later darting glances off screen. He then reaches for the bottle and takes a quick sip, struggling to maintain eye contact with the camera. The moment sparked a torrent of tweets, memes and even the Buzzfeed gif treatment. 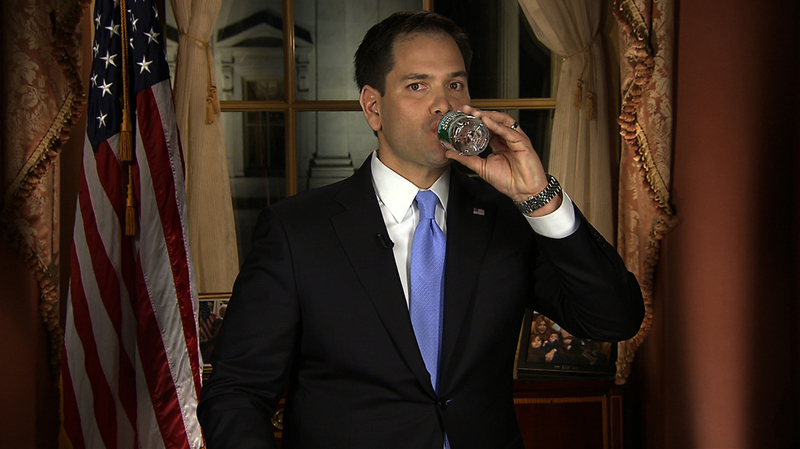 Rubio himself even got in on the fun, tweeting a water bottle captioned #GOPResponse. He later told ABC's Good Morning America: "I needed water; what am I going to do?" 6. He used a GOP credit card for personal expenses, "maybe it was a back wax." In 2010, the St. Petersburg Times — now the Tampa Bay Times — and the Miami Herald reported that the senator, while serving in the Florida House of Representatives, charged more than $100,000 to a credit card given to him to use by the state GOP from 2005 to 2008. Charges to the card included $1,000 in repairs to his family car, $7,000 for flights between the 2007 and 2008 legislative sessions and a $134 haircut. Rubio told the Times that he tried to pay back all his personal expenses, and that he was "as diligent as possible to ensure the party did not pay for items that were unrelated to party business." His then Senate race opponent, Charlie Crist, jumped on the scandal, telling Fox News: "He charged $130 haircut, or maybe it was a back wax. We are not sure what all he got at that place." 7. He was part of the "Gang of 8" on immigration. Rubio was a key figure in the congressional group — composed of four Republicans and four Democrats — who drafted a 2013 immigration policy overhaul. Key provisions of the proposal include providing a five-year path to citizenship for young undocumented immigrants brought into the country, revamping visa programs and increasing the number of visas given to foreigners with advanced degrees. "It is in our national interest to bring people out of the shadows," Rubio said in a 2013 news conference discussing the bill. "This is who we are. We are the most compassionate nation on earth."